open deck, screened porch, front porch 785 Sq. 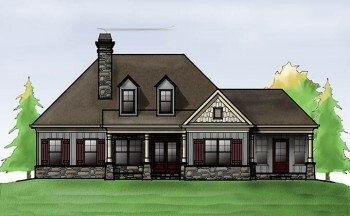 Ft.
Stonegate is a Lake House Plan with a garage and walkout basement. As you enter the Stonegate, you look over the open railings of the stairway and all the way through the windows on the rear of the family room. There is a dining room with coffered ceiling off of the foyer. The kitchen and breakfast room are open to the vaulted family room and have a great view of the fireplace and the built in cabinets that flank it. The master suite is located on the main level and has a vaulted ceiling. His and her closets flank the hallway on the way to the master bath. The master bath features separate vanities, a privacy room, a soaking tub, and a huge walk in shower.A 3 car garage, a mud room, laundry room, and several porches and decks complete the main level.The upper level includes a study loft, 2 bedrooms with walk in closets and a jack and jill bath. The lower level can be finished to include a recreation room, kitchenette, game room, a full bath, and two additional bedrooms. The rear of the house features ample porches and a wall of windows at the rear of the family room, breakfast room, and master suite. Stone, board and batten, cedar shake, and craftsman details complete the rustic yet traditional look of the Stonegate.